Dr Prior is a researcher in the School of Natural Sciences. Her current research focuses on tree growth and fire ecology. She has a special fondness for Callitris, a native conifer on which she worked intensively. She has also worked on the ecophysiology of savanna trees near Darwin, and salinity and irrigation of horticultural crops in the Murray-Darling Basin. Lynda has been based in Tasmania since 2009, during which she has worked with Prof. David Bowman on fire ecology, focussing on effects of fire on tree demography and on flammability of fine fuels. In addition, she has analysed growth responses of eucalypt trees to climate in temperate Australia. Surprisingly, this showed that eucalypts grow faster in cool than in warm climates. 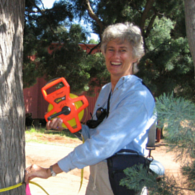 Lynda has also intensively studied Callitris trees, visiting stands of these conifers at more than 100 locations around Australia, as well as in New Caledonia. Lynda's undergraduate studies were in agricultural science, and her first position was as a Research Horticulturist with the NSW Department of Agriculture. She spent 12 years studying salinity and irrigation in citrus, grapevines and asparagus, but also became interested in the physiology and growth of native trees. This was the focus of her PhD when she moved to Darwin. She then held several post-doc positions studying the ecology, physiology and demography of savanna trees. During this time, she published on hydraulic conductance, photosynthesis, water relations and leaf attributes of trees in contrasting tropical environments, as well as the fire ecology of savanna trees. Lynda's research aligns to the University's research theme of Environment, Resources and Sustainability. Her varied research interests all relate to understanding how plants interact with their environment. She works closely with Professor David Bowman, examining ecological processes such as tree growth and wildland fire across broad scale environmental gradients. The Tasmania Wilderness World Heritage Area is characterised by its richness of natural and cultural values. However, the increase in large, high-intensity fires as a result of climate change and cessation of Aboriginal management presents a risk to the survival of native species. The context of this study is the 2016 bushfires in Tasmania, which had significant impacts on endemic species and peatlands across the Heritage Area. This project aims to advance knowledge in the fire ecology of temperate forest landscapes by understanding the spatial distribution of fire severity and the biological response of endemic species to large-scale, severe wildfires. Callitris glaucophylla is an iconic conifer of outback Australia, but there has been little recruitment sinceEuropean settlement in much of the drier part of its range. Here, seedlings can only establish in unusually wetperiods, and they are vulnerable to introduced herbivores. The lifespan and growth rates of C. glaucophylla aretwo critical but unknown aspects of its demography in the arid regions. We will use 14C dating to determine theage and growth rate of trees growing at the driest extreme of its range to assess the sustainability of thesepopulations.